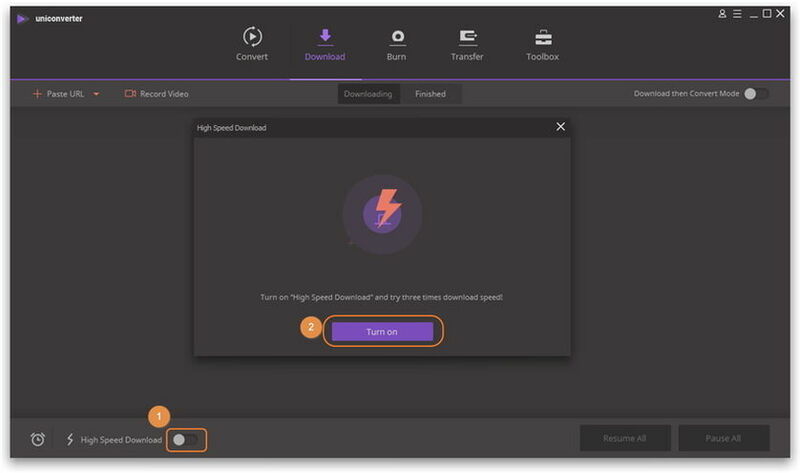 Wondershare UniConverter (originally Wondershare Video Converter Ultimate) is so carefully-designed that provides 6 tricks to better your downloading experience. Click + Paste URL in the upper-left corner, you’ll get a setting dialog window, from which you can set your download preference. Choose the video resolution or audio bitrate as you require, and the corresponding file size is listed on the right. You can download the Original Subtitles if the video has, and select the subtitle language as well. Generally, it chooses the system language by default. Check the box Set my choices as default and don’t show me again would keep your above download preferences as default and the setting dialog window will never pop up again. That is to say, next time you click + Paste URL, Wondershare UniConverter would start downloading immediately. If you want to change the download preference or recover the pop-up windows, you can go to Preference > Download > uncheck One-Click Download Mode for YouTube. 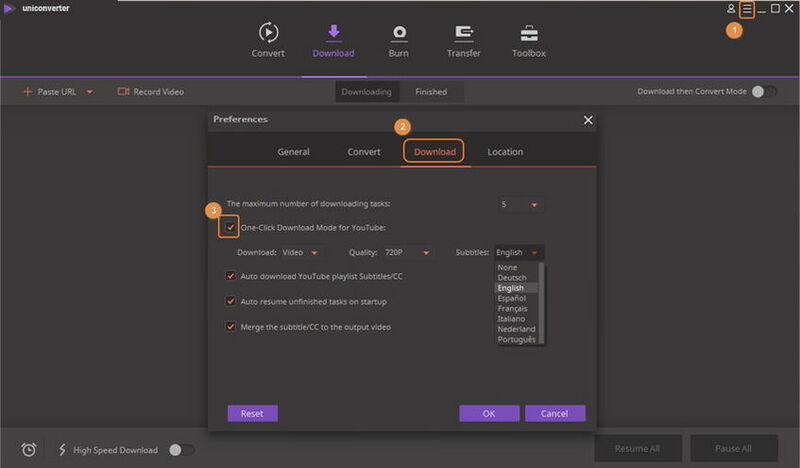 You can also set the maximum number of downloading tasks, auto download YouTube playlist subtitles/CC, auto resume unfinished tasks on startup, merge the subtitle/CC to the output video as well as the default subtitle language here. 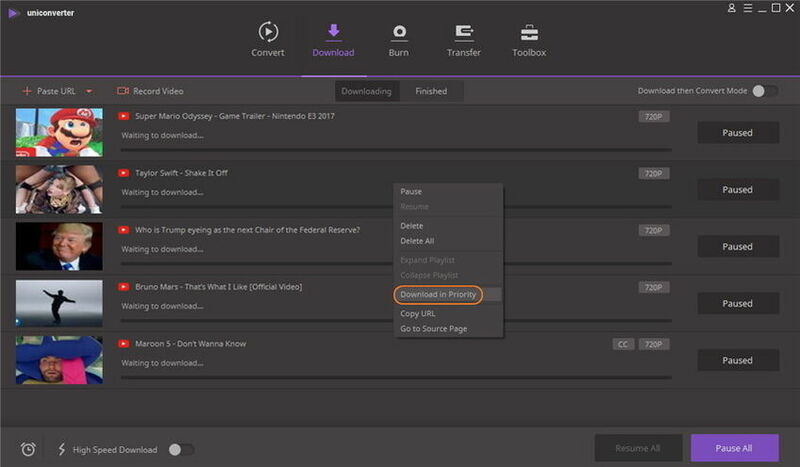 Before or while downloading, you can turn the console High Speed Download on to increase the download speed to 3 times faster. After turning on Turbo Mode, you can see the flash icon over the progress bar. Wondershare UniConverter (originally Wondershare Video Converter Ultimate) limits the maximum number of simultaneous download to 10 and downloads video in the order of being added. If you want to give preference to a video, just right click-the video to choose Download in Priority. 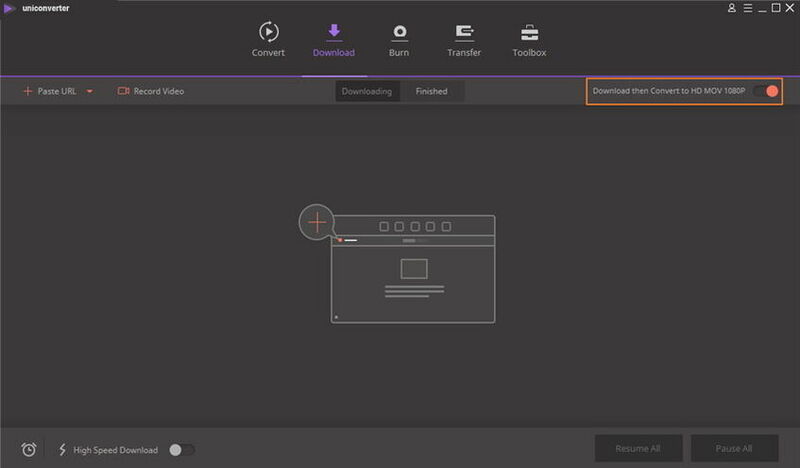 Wondershare UniConverter (originally Wondershare Video Converter Ultimate) downloads online videos in its original format by default. 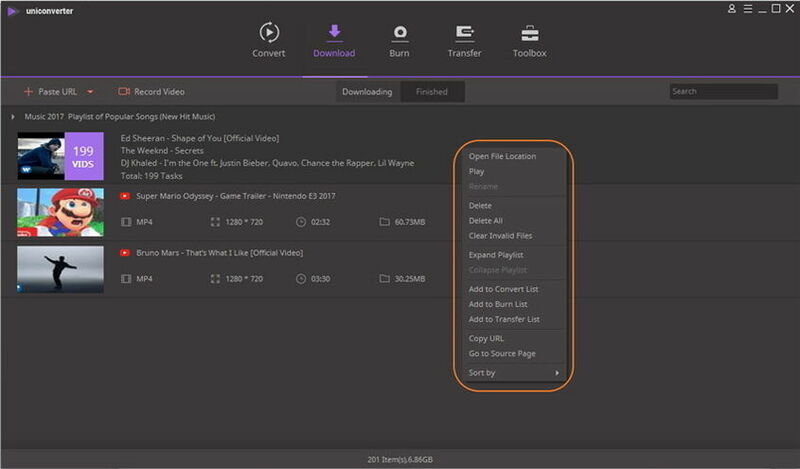 If you want to download to other formats, you need to turn the console Download then Convert Mode on. Then select your desired format in the left bar and double click the video resolution in the right, i.e., MOV 1080P, you’d get an interface as follows. 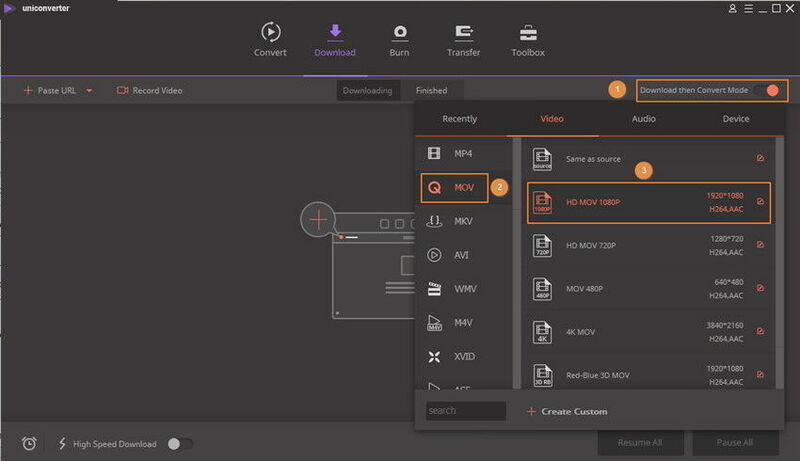 Now go on with Downloading Online Videos >, they’ll be downloaded in .mov. 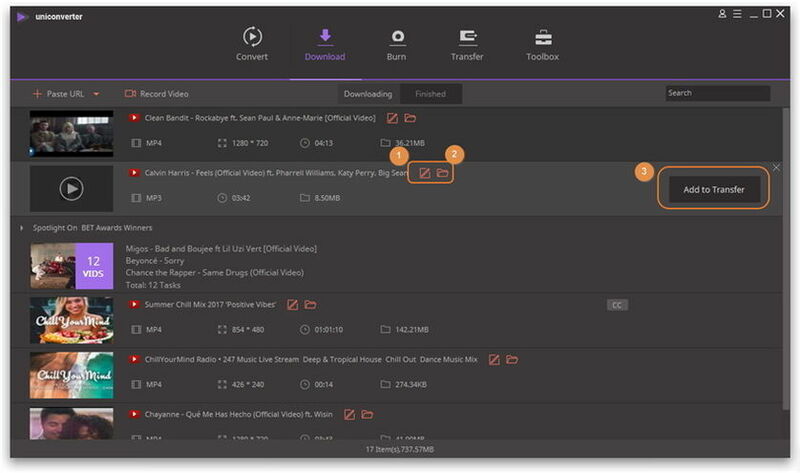 If you have a huge number of videos to downloading, then the task scheduler avoids you from waiting in front the computer. Click Task Scheduler button, the clock icon in the lower-left corner of the interface, there’re 4 modes for your choice: Do Nothing, Shutdown, Sleep and Exit Program. Just select one to set the task scheduler based on your needs. After downloading, you can switch to Finished tab to view the downloaded videos. 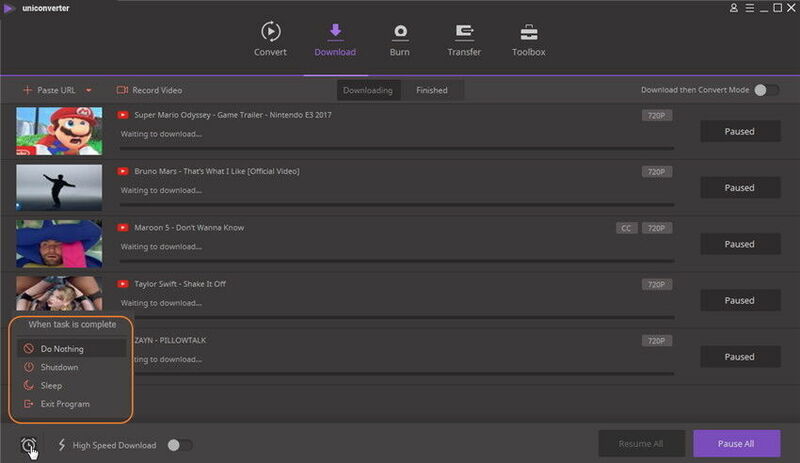 Move your mouse over the downloaded video and you’ll see 3 icons as the screenshot shows. They symbolize Rename video, Open File Location and Add to Transfer section respectively from left to right. 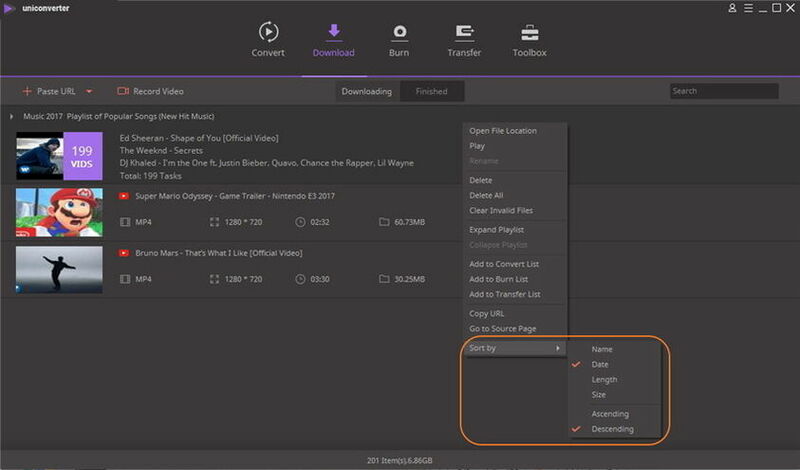 Right-click the downloaded video offers you more options to manage downloaded videos, including play video, add to convert list, add to burn list, go to the source page, copy original video URL and sort video. Click into Sort by, you can choose to sort video by name, date, length, size, ascending or descending.